The LatinoTakeover is happening outside of the current epicenter of all things tech – SXSW (Austin, TX). For events unfolding at SXSW follow us on our blog, Twitter and Instagram w/ #LatinoTakeover. In an effort to reach more Hispanic female consumers, Ford Motor Company partnered with Televisa Publishing + Digital in a national multimedia campaign to showcase the latest technology, gadgets and applications that help Latinas stay connected and simplify their life. The iPad application will be available for free download in the Apple App Store on March 4, 2013. 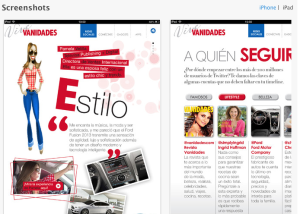 The launch of the Vive Vanidades Technology Guide iPad app marks the third time in recent months that Vanidades has created an innovative offering for the new platform. The campaign will harness the power of technology while leveraging Televisa Publishing’s content, platforms and programs, including the magazine, website, social media, iPad application and other promotional efforts.#LatinoTakeover.